Date of Your Event REQUIRED Please fill out this field. Please enter a date. (Select One) Choir Concert Conference Dance Recital Film Screening Graduation Ceremony Instrumental/musical recital Meeting Musical Play Speaker(s) Seminar Workshop(s) Worship Event Please fill out this field. My event is... REQUIRED (Select One) Open to the General Public A Private Event Please fill out this field. (Select One) Adults Only Families Youth Members Only Other Please fill out this field. Which best describes your organization? REQUIRED (Select One) For Profit 501(C)3 Non Profit Organization within the Diocese of Providence Please fill out this field. How did you hear about us? REQUIRED (Select One) Google Search E-Mail Facebook Word of Mouth Word of Mouth - Diocese of Providence Passed by the Building Already Knew About the Facility Other Please fill out this field. Our partners in providing a catered technical experience for your event . . . The Diocese of Providence reopened and rededicated the newly renovated McVinney Auditorium! As the diocese prepared to celebrate the 125th anniversary of the Cathedral of SS. Peter and Paul, Bishop Thomas J. Tobin expressed his desire that McVinney Auditorium would return to its former glory and serve as an inspiring gathering space, as well as provide a lasting legacy for Bishop McVinney. Following an eighteen month long renovation project, the venue now boasts new audio visual equipment (sound and projection), new furnishings and sparkling new lobby. 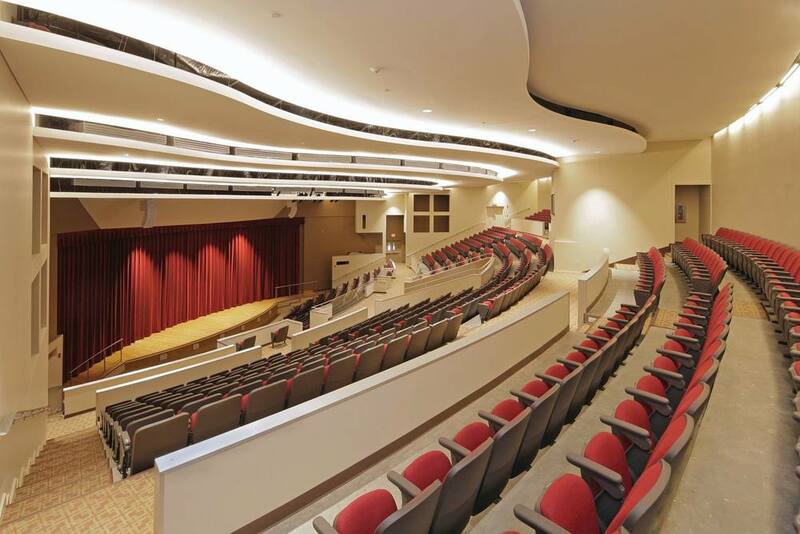 Handicapped accessible, this 750 seat auditorium is centrally located in Downtown Providence and is a wonderful location for ceremonies, lectures, performances, screenings and more. Start here - all about McVinney! Take a photo tour of our beautiful facility!